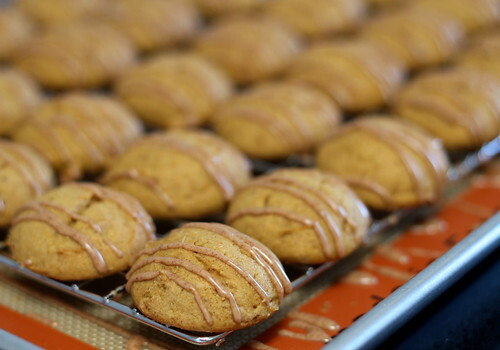 These iced pumpkin cookies — well, their gluten-ful counterpart — featured heavily in my fall baking rotation when I was hit by the PUMPKIN EVERYTHING bug in 2005. (I’ve since recovered . . . slightly.) My first time making them, my brain missed a beat when it came to the amount of pumpkin called for and substituted cup with another word — hint: three letters, starts with a c, not an uncommon measurement when it comes to pumpkin puree — you got it, that one cup became one can. After the icing sets, I like to package these cookies up in zip-top sandwich bags in groups of three (that’s how many fit across), or six if I’m planning on sharing. Into a freezer bag and ice chest they go, and then I just pop a bag out the night before I want to eat them, because I totally wasn’t kidding about the breakfast thing (they’re also great in a lunch box). Does the icing tend to get a bit messed up? You bet. Does it matter? Absolutely not. For a snack, dessert or with your morning coffee — I bet a homemade pumpkin spice latte would be AWESOME with them — you can’t go wrong! Preheat oven to 350°F. Line two large, rimmed baking sheets with silicone baking mats or parchment paper; set aside. In a small bowl (2-quart) whisk together dry ingredients (millet flour through 2 teaspoons pumpkin pie spice); set aside. In a medium bowl (4-quart) mix together butter, evaporated cane juice and egg (use a spoon or hand mixer) until well-combined and somewhat lightened in color, about 1 – 2 minutes. Add canned pumpkin and vanilla extract and stir until color is uniform. Add flour mixture to wet ingredients, stir until lump-free. Drop level tablespoons (a portion scoop is your friend here, the batter is quite wet) of batter on the prepared baking sheets, leaving about 1″ – 1 1/2″ space between cookies. Bake one sheet at a time in the preheated oven, about 16 – 17 minutes or until bottoms are golden brown. Cool on pan for about 1 minute before transferring cookies to a cooling rack. Once cookies have cooled completely, prepare icing. In a small bowl, whisk together powdered sugar through milk until smooth. Transfer icing to a zip-top sandwich bag and snip just a small amount of the corner, allowing the icing to flow (or a pastry bag fitted with a very small, circular tip). Drizzle icing evenly over cookies. Allow icing to set completely before serving or storing. Once iced, the cookies are best stored — wrapped in single layers — in the freezer. To serve from the freezer, remove from wrappers and arrange in a single layer on plate, loosely tent with plastic wrap and allow to defrost at room temperature (only a couple hours). I’m in the Autumn mood for a decadent brunch this weekend!! NEVER! It’d never be criminal to enjoy these with icing for breakfast — granted, I do live in the land of chocolate cereal :D.
Has anyone tried these without xantham gum?